The Armeg 18" Tool Tote with removable cover, provides the perfect hand tool carry case for small and bulky items. Fitted with a padded grip steel handle and shoulder strap for increased comfort. 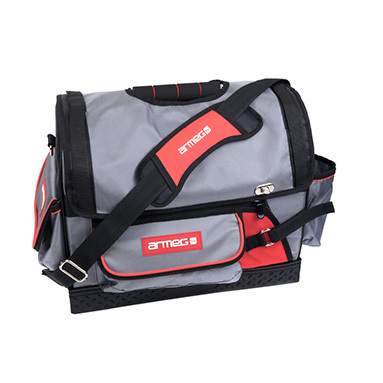 Armeg 18" Tool Tote Bag - DHTBAG001. Made from 1680D polyester providing a heavy duty and durable material. Square shaped waterproof base keeps the bag stable and allows for easy cleaning. Heavy duty stainless steel grip provides secure and comfortable lifting with ergonomic padded grip. Removable cover, providing flexibility and versatility. Open lid provides easy access to all tools, while closed lid protects tools keeping the contents clean and dry. Large internal storage area for bulky items in addition to internal and external elasticated pockets for screwdrivers and other items.